Mindsets Make All the Difference. Dara Goldberg, President, Leadership Mindsets Consulting, Inc. Leadership teams. Project teams. Sales teams. Business start-up teams. Sports teams. Healthcare teams. Construction teams. Performing arts teams. And the list goes on. What is the secret sauce that enables teams, in all industries, across all sectors, the whole world over, to perform and thrive to their absolute fullest potential? Why do some teams flounder, while others do fine, and others perform and succeed beyond bounds? Certainly, the skills and knowledge of individual team members, and the extent to which they are aligned and complement each other, play an essential role. Equally important is: a shared understanding of the work at hand; positive reinforcement and guidance between teammates and from others; a shared commitment to success; respect for one another, and for the team as a whole; healthy relationships among team members; and more. Mindsets. It is the mindsets of the team that make the difference. It is the mindsets of each team member, and the team as a whole (the team’s ‘brain’) that make all of the difference. Call it frames of mind, thought patterns, how people think, individually and collectively, or the lens through which individual team members observe and experience themselves, each other and the world around them. The team’s mindsets drive how team members, and the team as a whole behave; the choices they make; the relationships they have and how much they invest in them; the satisfaction they derive; their capacity to fully capitalize on their acquired skills and knowledge and, equally important, their ability to realize their natural talents; and so much more. The mindsets of individual team members, and the team as a whole also directly affect the level of connection and belonging that each team member feels, a carnal need that must be met for any individual and whole team to perform and thrive to their fullest. When teams possess and devote ongoing attention to sustaining healthy, productive and meaningful mindsets, they thrive. When their mindsets are not rich and healthy and aligned with the refreshingly human-centered manner of thinking that is the 21st century, they may do fine in some cases, but they will never reach their true potential and consistently raise it. The infographic above provides a snapshot of many of the mindsets that are essential for teams to feel, think and operate at their individual and collective best. These mindsets, among others, create the conditions for teams to genuinely connect, to trust, to take risks, to be curious, to be generous, to be vulnerable, to want the best for each other, to tap their skills, knowledge and natural talents to their absolute maximum potential and more. 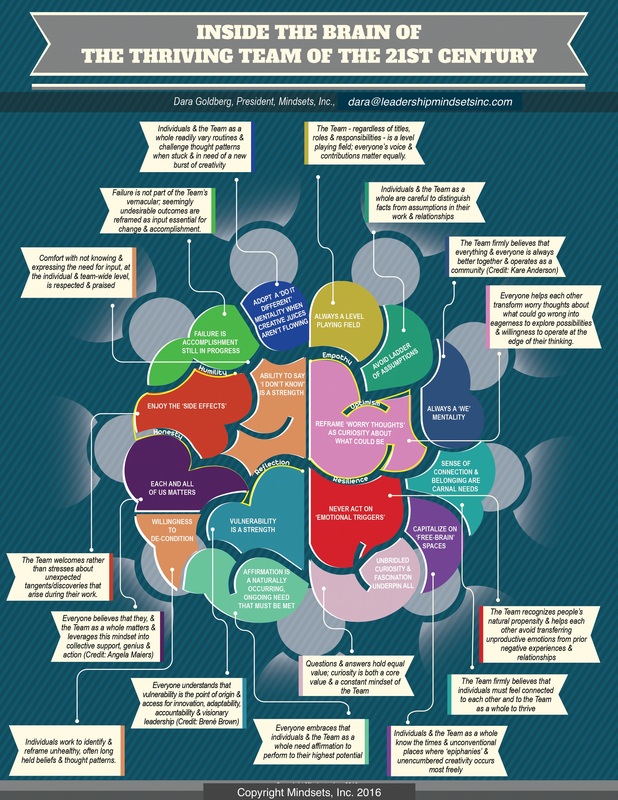 The image of the brain in the graphic represents the healthy, fluid, high functioning mind of individual team members and the whole team, and the lobes within the brain represent many of the essential mindsets. Running between the lobes are the arteries of Empathy, Optimism, Resilience, Reflection, Honesty and Humility, which reflect the pillars that serve as the support beams, guideposts, driver of all else. Does your team possess any of these mindsets? Do your team leaders and members recognize the importance of being attuned to and cultivating mindsets that position individuals and the team as a whole to thrive to their fullest and beyond?